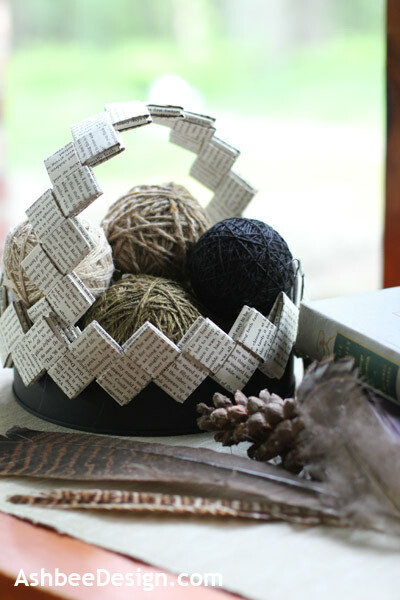 The pages from old books have become a standard craft supply. 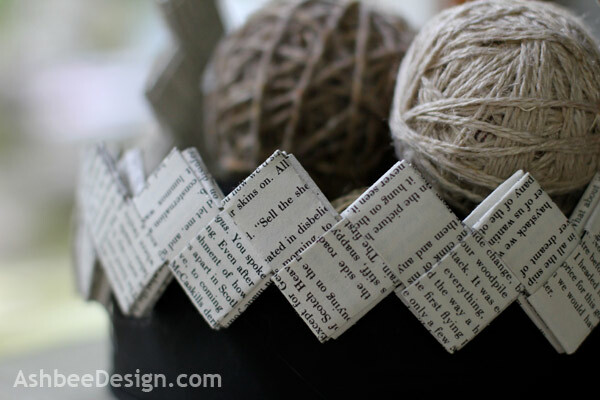 As I was doing some of the folded book designs I was reminded of the gum wrapper chains we made as kids. I applied that same idea to book pages. 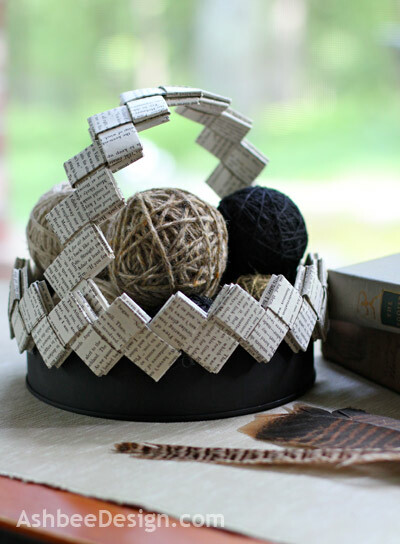 The result is this book page basket made from a repurposed cookie tin and the pages of an old, yellowed paperback book. I have filled it with yarn balls made from natural colors but I think it would look stunning filed with bright yellow Lemons or brilliantly green limes as well. I started by cutting the book pages to 8" by 3.5". Any similarly proportioned pages will work. 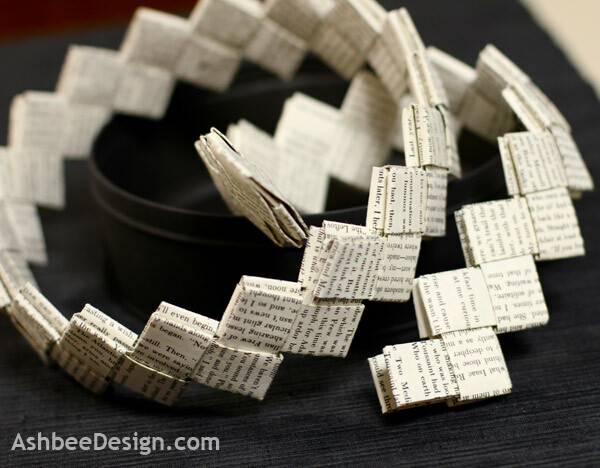 Book pages are much thicker than gum wrappers so the size of the chain you create is much larger. My original idea had been to make a desk accessory set for pen storage using a variety of tin cans. I found the paper chain was too large so I modified the plan to this basket. 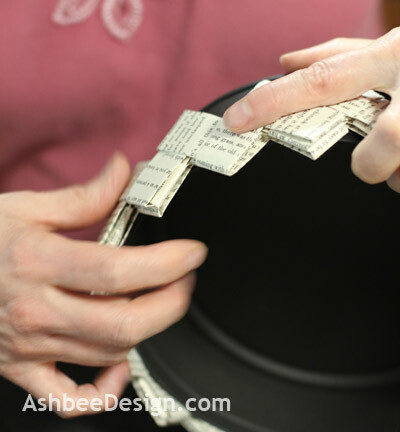 The larger cookie tin was better able to visually support the book page chain. There are many sites with step-by-step instructions on making a chain. Here is a beautifully illustrated diagram from Art Projects for Kids website. We Folk Art has a good step-by-step with photographs. 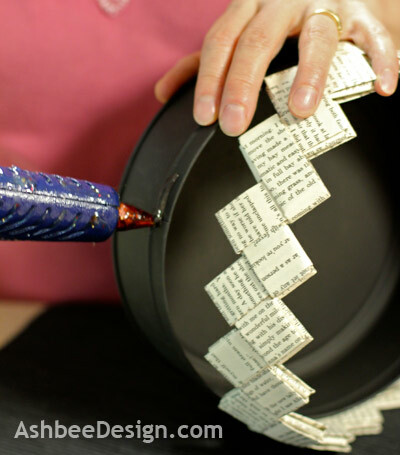 I used the book pages and made two chains, one long enough to go around the rim of my cookie tin, and one long enough to make the handle. 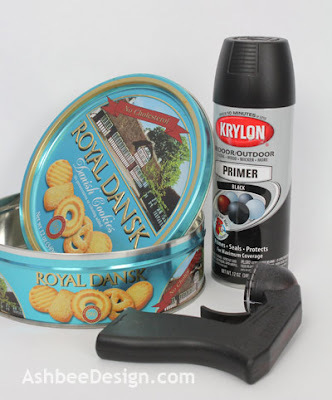 I also spray painted the cookie tin using flat black primer. I wanted it to have no sheen. I set up in the garage, and as always with spray paint, applied many light coats until it was totally flat black. 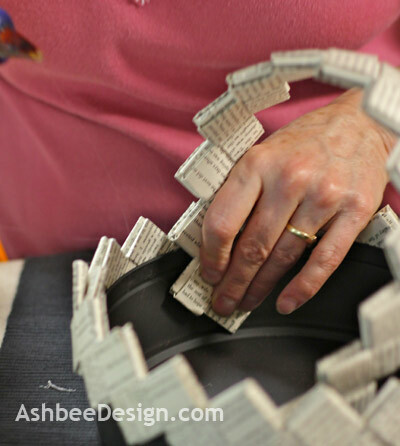 Once both the chain and the painting were completed, I heated up the glue gun and glued the first chain to the rim of the cookie tin. I mounted it high up on the rim so it created a zig-zag top edge. Again, using hot glue, I glued both ends of the basket handle in place. 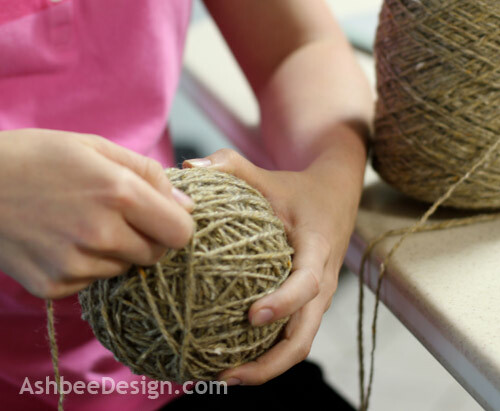 My daughter, Amy is visiting so I corralled her into helping me makes some yarns balls out of some old weaving yarns I had. Here is the final basket, a container to hold more of my ever expanding ball collection! I am sharing this post at these link parties. Come visit. That looks so terrific. Great tutorial too. Still thinking about other ideas for the paper chain. It is so tactical. I plan to keep experimenting. Thanks for dropping by and commenting Merry. No doubt about it. The ring would work as a crown as well. Takes a little too long to make a bunch of them though! Very cool looking. Did you spray anything on it after the spray paint? 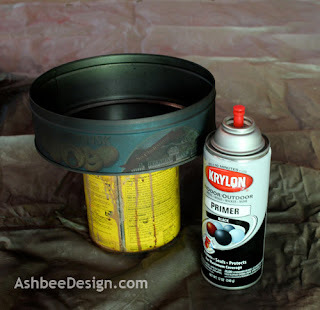 I have a project with an old tin as well and I was not sure what paint to use. Any suggestions? Thanks! Gina, I used Krylon Black Primer Spry Paint and I didn't coat it with anything else. I chose black primer because I wanted the tin to be flat black. I had tried one with satin and it was too glossy for me. This is my only experience with spray painting tins so I have no advice with regards to longevity, or a comparison to other brands. Good luck with your project. What a cool basket! It's very unique... and that is awesome! Unique seems to be important. So many repeat ideas keep bouncing around the link parties. I am trying hard to come up with new approaches or new tutorials. Some weeks the brain is just too tired for something new though! You are welcome, thanks for visiting and commenting. I am looking for my book page ideas. love that so much better than food wrappers! Absolutely. I no longer chew gum but we used to buy tons of it just to get the wrappers! That is WAY cool! A first of its kind for sure and just darling. :-) Thank you so much for sharing this with us at Inspiration Friday this week! Love this! 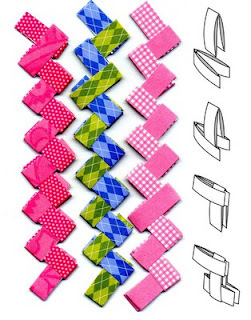 I remember making bracelets like this as a child out of gum wrappers!! ;) Thank you for sharing at Uncommon! What a great craft!!! Thanks so much for sharing a tutorial, I'll have to try this out sometime soon! Love it! Making the chain can be time consuming. I just cut the paper and kept them with me. Whenever I had a free moment, or was on the phone, I'd fold a few more links to the chain. Once that was done, making the basket took no time at all. Have fun! Simply wonderful! I remember making these gum chains in High School - mine ended up being around 15 feet long! This is so clever -- adding it to my 'book idea' board! LOVE IT!!!! This is sooo unique!!!! 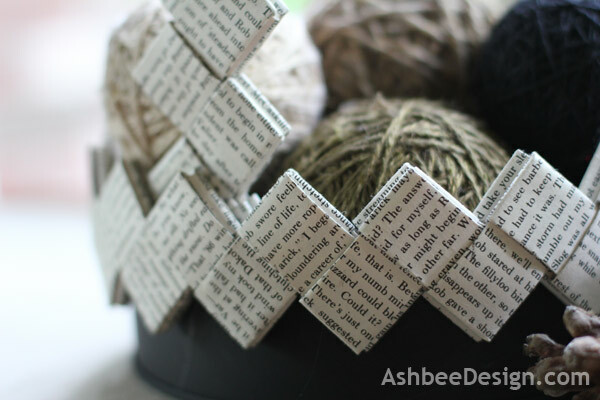 Love that you used book pages! Clever use of the book pages and the chain! (probably oversight (on your part or mine...)... but ..would you please be so kind so as to link back to our party, when you have a moment. thank you so much in advance and i hope you'll come bring us more projects like this over time! What a great project! I love the idea of using the book pages for the chain! I would love for you to link up Thursday to It's a Party!